Both Manchester teams had one last opportunity to make it to the next round. City's task seemed less daunting, but Mancini wanted no compromise, choosing a rather different side for the second leg. Instead of the more defensive-minded De Jong and Barry, the Italian coach went with Pizarro and Touré in the middle and Johnson instead of Milner. It seemed Mancini had learnt enough about his opponent in the away match and tried to counter with his own strategy. 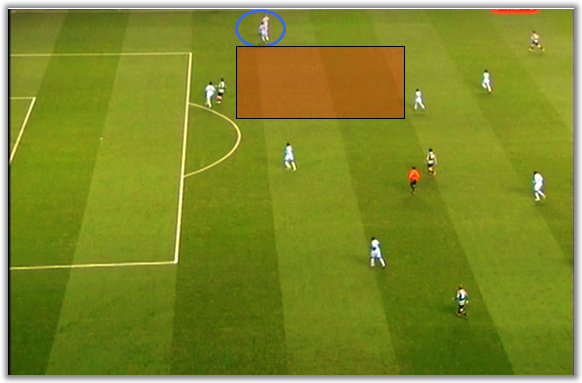 Pizarro's presence meant City could coordinate their attacks from behind, instead of relying on David Silva. If there's one thing Pizarro excels at, it's shuffling the ball from one side to another and spraying diagonal balls to the flanks. In fact, that seemed City's route of choice - Pizarro (or Yaya Touré) would move the ball around and then try to connect with Johnson on the right wing. With Micah Richards also trying to push forward and Yaya Touré on the same side, there was enough space for Sporting to break away. As for Sporting, the picture below is a perfect example of their strategy - in fact, it wasn't that much different from the first match. The Lions had a good start, with clearly defined pressure zones and a tendency to exploit the space behind Richards. However, that strategy wasn't necessarily the most useful here - since Pizarro was running the show in an area that Sporting wasn't prepared to reach. One of the key aspects of every opponent that goes up against City is how to defuse David Silva's threat. Sporting manager Ricardo Sá Pinto chose once again to use Izmailov narrower than Capel, but this time the Russian midfielder was almost man-marking the Spanish wizard. By doing that, Kolarov was able to motor down the right wing, which meant Carriço was dragged on to that side, to make sure that the Portuguese team always had 2v1 situations. 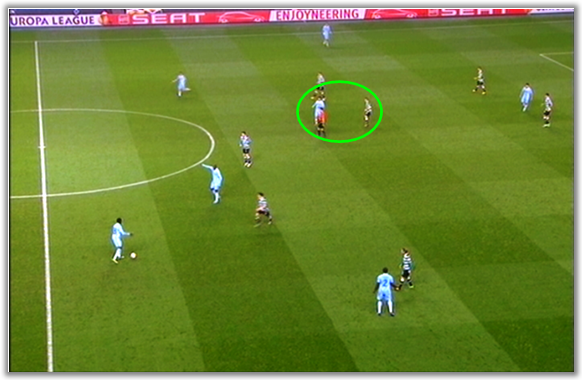 Conversely, it meant that Sporting found it easy to overload Kolarov down that flank, since Silva was not eager to track back and there was no De Jong or Barry for the defensive work. On the other wing, Capel showed once again that he may never fulfil his potential, since his movement and decision-making are strangely similar to a winger from the '90s. 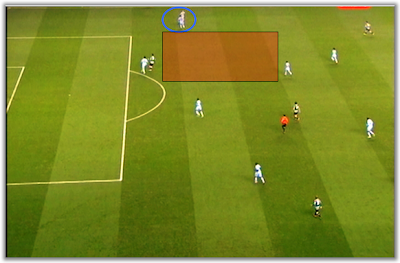 Sporting's two goals came from City's oddly bad defensive positioning. The first one was a wonderfully taken free kick by Matías Fernández, as a result of a desperate tackle from Balotelli on Insúa in the space behind Yaya Touré (once again). The second was even stranger, since it was a dead ball some 60 yards from goal. Polga made a long pass to the right wing and Savic's decision to go for the aerial duel wasn't as awkward as the team's decision to provide absolutely no cover for the second ball. Sporting were two goals up by half-time - and deservedly so. Savic goes for a late aerial duel with unbelievably poor coverage from his team. Mancini replaced Johnson with De Jong for the second half, going for something of a 4x2x3x1, with Pizarro and De Jong in the middle. The Italian seemed to finally realise that it was pointless to insist on the wings, where it was obvious Sporting always had the numerical advantage there. City's first goal was a logical follow-up to that reasoning, with Balotelli creating indecision on who should mark whom and opening up space. 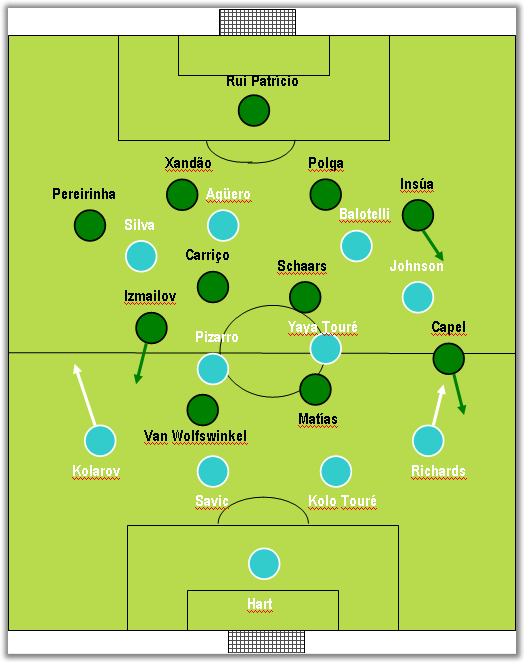 Sporting's classic 4x4x2 was easy to bypass through the centre and once City realised that, the floodgates opened up. As if that wasn't enough, the removal of both Ricky van Wolfswinkel and Matías meant that Sporting had no out-ball and that City was able to pile on the pressure. The Lions were tiring out and Renato Neto's foolish penalty didn't help things. The Portuguese ended the match in unnecessarily desperate fashion, forced to last-ditch efforts to try to avoid what would be a tragic and overall unfair outcome. Pereirinha and Izmailov's performance should be highlighted. The former was his usual self: sensible, solid and level-headed. The latter was a true hero and it's not every day you see a player of his calibre going to such lengths for the sake of the team.